I had different priorities in college and going to the zoo sort of fell off my radar, but trips ramped right back up in the past five years, as soon as my friends and I started having kids. And now a trip to Como is one of the highlights of summer for my boys, especially when it includes a trip to Como Town Amusement Park. Have you ever been? No? You have no idea the fun you’re missing. Como Town is like a summer-long fair. 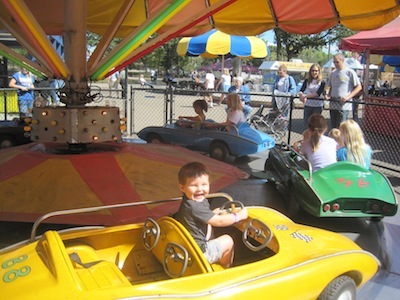 There are 18 rides for kids anywhere from 2 to 12, carnival-style games, pulled pork sandwiches and pizza and ice cream, and excited squeals, parents covering their kids in sunscreen, plus kids jumping up and down exclaiming “That was SO FUN! Can I do it again? !” Even the grumpiest little one can find a smile here. It’s nearly impossible to be sad in such a joyful environment. Como Town Amusement Park is now open for the 2013 season. It’s adjacent to Como Park Zoo & Conservatory, on Midway Parkway in St. Paul.